Jam-packed with thousands of fascinating facts and interesting info this fun-filled Q&A book is sure to satisfy the most curious kids (and adults too!). The team that brought you WHY? flips that question around to deliver more than 1,111 more awesome answers, brain-bending breakd... read full description below. 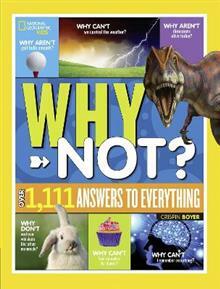 Jam-packed with thousands of fascinating facts and interesting info this fun-filled Q&A book is sure to satisfy the most curious kids (and adults too!). The team that brought you WHY? flips that question around to deliver more than 1,111 more awesome answers, brain-bending breakdowns, and epic explainations to all kinds of burning questions about how the world works. With the first book in the series, we answered WHY? In this exciting follow-up, we figured WHY NOT? The concept is simple. Got a question? Boy, do we have answers! Over 1,111 of them. Why don't you keep growing your whole life? Check out the human body section. Why aren't we traveling by jetpack yet? Tech has your answer. Why aren't school busses red? Flip to the pop culture chapter. Why aren't dinosaurs still alive? Why can't you walk on clouds? It's all there! With hundreds of topics ranging from silly to serious, we've got the expert information in a fun Q&A format that will keep kids digging for answers. Answers include all kinds of fascinating extra info like top 10 lists, weird-but-true facts, explorer profiles, and cool activities. Now, go stump your parents!